Registration is available for individual days at $150. Call the front desk to sign up! This year’s Resident Roll Call will feature Andrew Coombs, Lindsay Scypta, and Steven Young Lee. This workshop will focus on throwing and surfacing porcelain; Andrew will focus on throwing forms with handles and inlaying stamps, Lindsay will talk about custom tools and layering techniques, and Steven will go over throwing in sections. One artist will demo per day from 10am-12pm, and a hands-on component will be from 1pm-4pm. A public slide lecture will be held on Sunday starting at 5:30. 2018 will be Clay Art Center’s 20th anniversary for the Artist-in-Residence program. We are honored to have these past residents participate in this program. Andrew Coombs began his ceramic career making pinch pots in his father’s pottery studio. His academic career ranged from chemistry to philosophy and back to pottery, and he earned his MFA in ceramics in 2008 from the School for American Crafts at the Rochester Institute of Technology. After graduate school, Andrew was awarded the position of Artist in Residence at the Clay Art Center in Port Chester, NY. After the CAC, he worked as a Professor of Ceramics and Ceramics Laboratory Technician at the University of South Carolina. He is currently a Professor of Art at Polk State College in Winter Haven, FL. He enjoys making functional pottery, giving people the opportunity to interact and form personal connections with his work. Lindsay Scypta holds a BFA in Art and Design from the New York State College of Ceramics at Alfred University and a MFA from The Ohio State University. She was an Artist-in- Resident at Clay Art Center in Port Chester, New York. Returning to Ohio in 2014 as an adjunct instructor at Owens Community College and Lourdes University, Lindsay continues balance teaching and making. She had a solo show at Morean Center for Clay in 2015 and was a recipient of the Toledo Museum of Art’s Palmer Scholarship, providing support to conduct visual research in Paris, France. Her work was published by Gingko Press in the New Age of Ceramics, Lark Books 500 Vases and she was awarded Emerging Artist by Ceramics Monthly in 2017. Her influences include the stone tracery of Gothic cathedrals, Victorian fretwork and the history of the dining experience. Working strictly with porcelain clay, the work is thrown, trimmed, altered and decorated, then fired to cone six in an electric oxidation atmosphere. Much of Lindsay’s MFA research was centered around not only the history of the table but also the development of laser cut tools, stamps, and molds that she continues to challenge and apply to her work. Steven Young Lee has been the resident artist director of the Archie Bray Foundation for the Ceramic Arts in Helena, Montana since 2006. In 2004-05, he lectured and taught at numerous universities throughout China as part of a one-year cultural and educational exchange in Jingdezhen, Shanghai and Beijing. In 2005-6 he was a visiting professor at Emily Carr Institute of Art and Design in Vancouver, B.C. Steve has lectured extensively in North America and Asia. In March 2013 he participated on a panel, “Americans in the Porcelain City,” at the Metropolitan Museum of Art in New York. 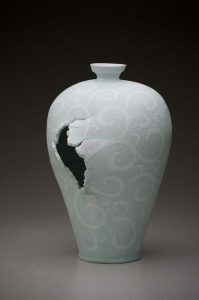 In 2013, he was one of several international artists invited to participate in “New Blue and White,” an exhibition at the Museum of Fine Arts in Boston that featured contemporary artists working in the blue-and-white tradition of ceramic production. In the Fall of 2016 his work will be featured as part of the Renwick Invitational at the Smithsonian Museum in Washington, D.C. He is represented by the Duane Reed Gallery, Ferrin Contemporary and The Archie Bray Foundation Gallery. His work has been collected by the Smithsonian Museum, the Daum Museum of Contemporary Art, the Four Seasons Hotel in Seoul, Korea, as well as many private collections. Steve received his BFA and MFA in Ceramics from Alfred University. Originally from Chicago, he lives in Helena with his wife, Lisa and their son and daughter Gavin and Florence.